The most interesting aspect of this quote is that it suggests the possibility that the VA may be reconsidering signing with Cerner at all rather than just hammering out specific contract terms and conditions, although at this point the money has been allocated, the no-bid decision has been announced, Wilkie doesn’t seem to have a problem with Cerner, and various members of Congress and the White House have made it clear they expect the VA to get the project underway, making it likely that the deal will be done. From Apricot Sky: “Re: [EVP/CIO name omitted]. Heard he has left the organization. That’s huge!” Unverified, so I’ve expunged the person’s name until if/when I get a response to my inquiry from the health system. His LinkedIn remains unchanged. UPDATE: Memorial Hermann Health System confirms that EVP, Chief Strategy Officer, and CIO David Bradshaw has left the organization after 20+ years. From Clapton is a Bishop at Best: “Re: GDPR. I seem to have slept through the discussion. Do readers feel US health IT will require changes before the end of the month, or is everybody assuming we’ll be OK as long as we are HIPAA-compliant and not operating in the EU?” The EU’s General Data Protection Regulation enhances the privacy of all EU citizens and regulates the exportation of their personal data outside the EU. It guarantees “the right to be forgotten,” mandates prompt breach reporting, requires opt-in consent for data sharing, and carries big fines for violation. 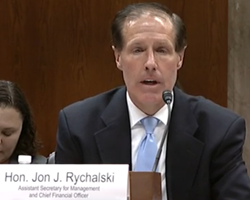 US companies, including health systems, fall under GDPR requirements only if they collect information from anyone who is physically in the EU at that moment (or at least that’s how I read it) and that’s the big out – GDPR doesn’t apply when a EU resident receives care in the US since they aren’t physically in an EU country at that moment. Potential health system problem areas for the May 25 implementation date mostly involve web pages that collect information from anyone via a contact form, survey, or newsletter signup, in which case you’re on the hook if one of your respondents is in an EU country. 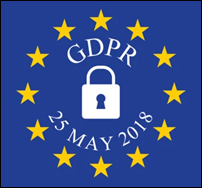 I look at GDPR as a potential competitive advantage for a US-based health system since patients are always worried about privacy, although I doubt GDPR awareness is high among the US population and therefore they might not care either way. I don’t know what impact GDPR has on EHR vendors that sell to EU customers. I’ll open the floor to readers. From Southern CIO: “Re: CHIME. It bothers me when I receive a message from CHIME that includes a vendor name, as in this example. I looked to CHIME as being focused on members and not corruptible by the industry. I will chalk it up to a sign of the times.” HIMSS long ago eliminated the line of decorum between vendors and providers and in fact turned itself into one big, profitable vendor itself in its “ladies drink free” model of using low-paying provider members to attract high-paying vendors anxious to sell them something. It’s brilliant as a business strategy as long as providers don’t rebel at being exhibited like Amsterdam red-light district hookers to salivating vendor-johns, which based on casual HIMSS conference observation, is questionable behavior that is nonetheless entirely consensual all around. Welcome back to returning HIStalk Gold Sponsor Burwood Group. The 250-employee, Chicago-based healthcare IT consulting and integration firm helps organizations develop strategy, deploy technology, and create an operational model, also working with them to improve patient safety, quality, and satisfaction outcomes by applying expertise in technology selection, clinical communication strategy, facility transformation, and end-user adoption planning. The company’s clients have realized improved staff engagement and waste reduction through workflow automation, meaningful clinical alerts, and streamlined communication and collaboration. 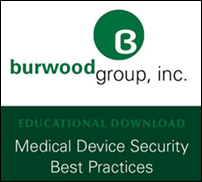 Thanks to Burwood Group for supporting HIStalk. Listening: new suave harmonies from The Temptations, which despite frequent member changes in the group’s 50+ year history, still have one original member left in the 76-year-old Otis Williams (I’ll defer to their amazing musical legacy by declining to snarkily dismiss the group as “The Temptation”). The album features covers of present-day hits from Bruno Mars, The Weeknd, and others, while the album’s bonus track of “Stay With Me” covered gospel style is stunning. I shall acknowledge and support this premise – after some number of decades, a band with few or even no original members left can still rightfully perform under the original name as long as it respects its legacy in accepting the torch as handed off by the founders, no different than a symphony whose membership revolves while its sound remains the same. Anyway, today’s Temptations may well still dutifully cover the band’s nostalgia-inducing hits while strutting 1960s-style hokey dance moves, but they are far from a novelty act – their new music is nothing short of contemporary and grand. Analytics vendor Innovaccer secures $25 million in a funding round that brings its total raised to $41 million. The Sequoia Project will divide its corporate structure into two subsidiaries – Carequality and EHealth Exchange – this summer. 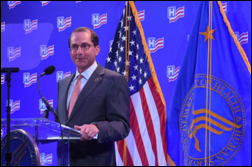 The EHealthExchange health information network, which will adopt the Carequality framework, is used by 59 HIEs and 15 EHR vendors. 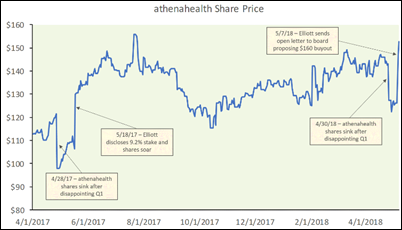 Healthcare Growth Partners examines the trend of publicly traded health IT companies going private, as in the case of what Elliott Management is proposing in its bid for Athenahealth. HGP says market dynamics have changed such that private companies may be valued higher than their publicly traded counterparts, adding that acquirers may believe that paying a premium for full control may more than offset the built-in discount for share illiquidity. My unsolicited enhancement to HGP’s analysis is this – in a poor, thin IPO market, it may make sense for investors to take over a struggling company private by buying all shares at a premium, improve its operations and financials, and then take it public again down the road when conditions have improved and investors are ready to chase the next sure thing. NantHealth reports Q1 results: revenue up 18 percent, EPS –$0.21 vs. -$0.34. NH shares have lost 10 percent in the past year vs. the Nasdaq’s 21 percent gain, valuing the company at $334 million. Wes Wright (Sutter Health) joins Imprivata as CTO. AMIA announces a fellowship (FAMIA) program that targets applied informatics practitioners. 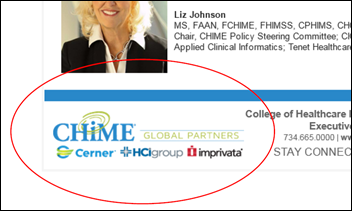 It sounds much like the lightly-regarded, non-academic FHIMSS or those fellowships sold by medical membership groups (FACOG, FACC), whose primary focus seems to be creating an ongoing revenue stream for the parent organization by charging would-be fellows to evaluate their credentials and provide them with mandatory ongoing education and membership (although to its credit, HIMSS does not require FHIMSS holders to renew their fellowship, so there’s no ongoing expense). It appears that you’re in as long as you work in a relevant job, have been a member for years, and can get other members to vouch for you – no effort is required beyond completing the application. I would question whether the accomplishment really means anything that isn’t already clear on someone’s resume, but people love having alphabet soup after their names and a wall full of self-love certificates. 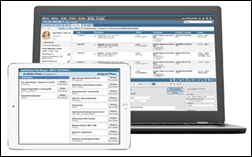 AdvancedMD develops Rhythm, cloud-based software that puts EHR, PM, RCM, and patient engagement tools on a single platform. Wellsoft works with GoRev to develop integrated EHR, PM, and RCM software for urgent care practices. Medication administration software vendor EBroselow offers a free version of its dosing software for medical emergencies. The Indiana Family and Social Services Administration will implement Cerner Millenium and RCM software at its six inpatient psychiatric facilities. Mayo Regional Hospital (ME) chooses Cerner Millennium and revenue cycle solutions using the CommunityWorks hosted deployment model. Northern Valley Indian Health will deploy EHR software from EClinicalWorks at seven locations in California. Today’s compartmented system is a burden on both patients and providers. Imagine if I could have shared my medication list just once. Imagine if, instead of running through my story with each new contact, I could have told it just once. Think about the opportunities for mistakes and inaccuracies that would eliminate—and think about the time that would free up for seeing more patients, offering them the care and attention they need. Now, think about that not just in the context of one guy with an angry colon, but across 330 million Americans: It is amazing what freer exchange of information would mean for our whole system. That is the promise of interoperability. 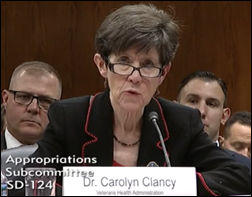 At the VA budget hearing, VHA Executive in Charge Carolyn Clancy, MD says telehealth will be the VA’s “killer app,” not only for providing services, but also for recruitment. 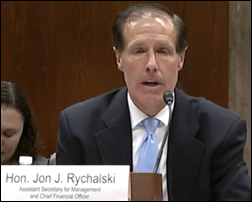 By 2020, all VA clinicians will be required by their job descriptions to be available to provide telehealth services. The CEO of drug maker Novartis goes into damage control mode after STAT reveals that the company paid $1.2 million to President Trump’s personal lawyer Michael Cohen in trying to get a leg up on a new, unknown White House administration. The company said paying a self-proclaimed Trump fixer to gain access was a mistake, but blames its former CEO, who left in February 2018. It also notes that Cohen was unable to deliver the work he promised, but couldn’t be fired because of the contract the drug company signed (he’s a lawyer, after all). 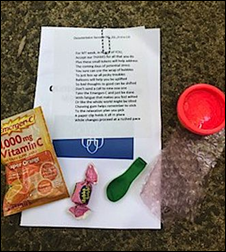 Mayo Clinic attempts to cheer the 400 transcriptionists it is laying off with gifts for Medical Transcriptionists Week, which starts May 13. The transcriptionists, who have until May 19 to accept severance packages, aren’t convinced that the provider’s new Epic system in Rochester isn’t responsible for their downsizing. Meanwhile, a local TV station says it has received several complaints from temporary nurses who were hired by contractor HCI to help with the implementation. One unnamed nurse was quoted as saying, “Since we’ve been in orientation with HCI, we have been verbally abused, we have been intimidated, we have been threatened that we would lose our job, not on a daily basis, but almost a nearly hourly basis.” HCI Group says it will look into the issues raised during the training sessions. The Michael J. 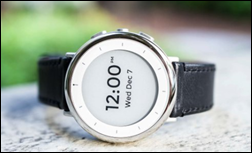 Fox Foundation and Alphabet’s Verily division will outfit 800 participants with the Verily Study Watch as part of a two-year project that will capture fitness, environmental, and physiological data, which will then be made available to independent Parkinson’s researchers. A small survey of hospital RCM decision-makers finds that 69 percent use more than one RCM vendor, resulting in problems with denials that impact their bottom line. A senior living center nurse is charged with the death of the father of former National Security Adviser H.R. McMaster. The contract LPN is accused of failing to perform neurological checks after finding his patient following an unwitnessed fall, then falsifying the medical record to indicate that he had done the exam. 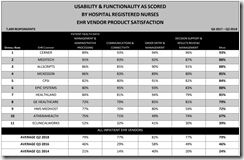 A Black Book survey of 7,400 hospital nurses finds that only 4 percent are so frustrated with their EHR that they want to go back to paper recordkeeping, down from 26 percent in 2015. Nearly all respondents say their IT department responds quickly to their suggestions for EHR documentation changes, although 82 percent complain that they don’t have easy access to computers or mobile devices in patient care areas and their productivity suffers accordingly. Nearly all respondents say that that EHR competency is a highly-sought employment skill, while 80 percent of job-seeking RNs indicate that the EHR a hospital uses is an important part of their decision to take a new job. The American Cancer Society adds the Healthgrades physician search finder tool to its website. CareCloud adds speech-recognition technology from NVoq to its EHR documentation tools. Loren Mann (Advisory Board) joins The Chartis Group as performance practice director. Cumberland Consulting Group will sponsor CBI’s Medicaid and Government Pricing Congress May 21-23 in Orlando. Elsevier partners with PerkinElmer and its ChemDraw software to enable faster, more intuitive chemistry research. EClinicalWorks will exhibit at the Kentucky Primary Care Association 2018 Spring Conference May 14-15 in Lexington. Hayes Management Consulting will exhibit at Centricity Live 2018 May 16-18 in Las Vegas. HBI Solutions will exhibit at Pop Health East May 14-15 in Boston. The HCI Group partners with the Mayo Clinic (MN) on a successful go live in Rochester. Healthwise and Iatric Systems will exhibit at ANIA through May 12 in Orlando. Huntzinger Management Group congratulates customer Adena Health System on its 2018 Gallup Great Workplace Award. Image Stream Medical will present at Product Camp Boston May 12. InterSystems will exhibit at the Healthcare Providers Transformation event May 15-16 in Dove Mountain, AZ. Kyruus will present at RevDev18 May 16 in Boston. Audacious Inquiry Director of Master Data Management Services Jeremy Wong joins The Sequoia Project’s new Patient Unified Lookup System for Emergencies Advisory Council. Aprima concludes an award-winning fiscal year as it looks ahead to its 20th anniversary. Change Healthcare announces it will work with Microsoft and Adobe to improve patient relationship management and engagement initiatives. Spok forms physician and nurse advisory councils for its Care Connect platform. Access HealthNet partners with Datica to ensure compliance requirements are met for its healthcare bundling platform. Datica will provide security and compliance layers for cloud-based bundled payment solutions vendor Access HealthNet. Re: FAMIA – if they model it after the ACMI fellowship, I think it could be successful. ACMI is full of academics who don’t have a clue about real world issues that Informaticists “in the trenches” deal with, and so would be nice to have some formal recognition for those of us who actually get things done (instead of just write about them, like lots of ACMI members). Re: Memorial Hermann – That really is quite big news about DB leaving. I know that they had been searching for a new CIO as Witt/Kieffer held the recruiting contract (public information on their website so no confidentiality there). My understanding is that they were splitting DB’s role as he was also Chief Strategy Officer, so there would have been a split of CIO and CSO. That is a massive undertaking for the right candidate and will be a very desirable position. Chances are, it will leave another void at a major Health System as if you check the 990 Tax forms of Memorial Hermann, their executives are very well compensated. My hope is that with the constant changing of CIO’s, health systems will start looking to develop executive talent either internally or looking outside for the right set of skills and talent. We get stuck too much in this mold of wanting 20+ years of experience, etc. That is not to say that experience isn’t a good thing, but we also cannot pigeon hole our selves. Heath Systems need to start taking chances, there is a wealth of talent out there ready to make a difference. CIO’s can no longer just be the smartest, hands on, IT person in the organization. They need to see the big picture, be visionary, embrace new methods/technologies and be a business enabler for the organization. IT cannot be looked at as just a cost center anymore. Every day, the CIO should be asking: How can we use technology to improve the care that our clinicians provide and how can we use technology to improve the patient experience. OK, Clapton is a Bishop at Best is hands down the best commenter screen name ever.